I checked with my insurance company, and the blood work is covered 100% as part of a normal checkup, because “The doctor diagnosed the test right” (her words – i.e., he ordered the test using the right ICD-9 code). BUT, the lady was careful to point out “This is not a determination of benefits, just a description of services.” How’s that for malarkey? “We’re not saying you WILL be reimbursed when you submit the claim – I’m just telling you what the policy says.” But she’s required to say it, because the company that denies claims is not accessible through customer service and might possibly deny the claim, even though she said it should be covered. And I am not allowed to talk to someone who does know, right now when I need the service, to actually find out. The only way to be sure is to file a “predetermination” and wait a week. If I don’t and the determiner says no later, I’m stuck with it. Guess who’s holding all the cards and all the power behind that veil of secrecy? Anyway, I got the blood taken, and in a couple of days the results will be sent to him and visible to me online. But really – no, really – what did this cost? And I said “So in my case, what would that be?” She said there’s no way to know. Chaos. Behind a veil of secrecy. Observe, ladies and germs: money flows around, behind a veil of secrecy, and nobody we are allowed to talk to can give us any information so we can make responsible, informed choices. I say, let patients help control the cost of care. Until then, let’s not let anyone say consumers are the cause of rising costs. p.s. As always on these calls, I asked if I could talk to the people who do know, and this time, much to my surprise, she said yes – she gave me the phone number of the company who actually negotiates the prices! This is the first time anyone’s offered it. 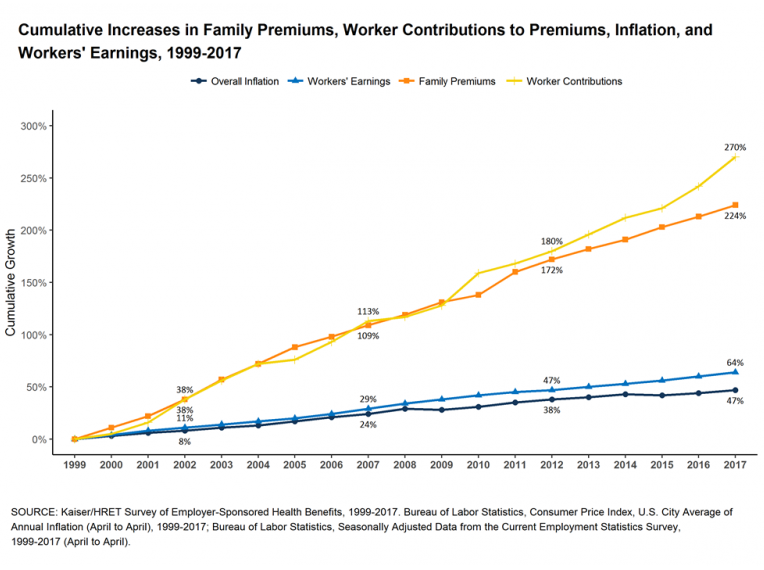 The slides above only compare costs against wages – those slides say nothing about what we get for our money. 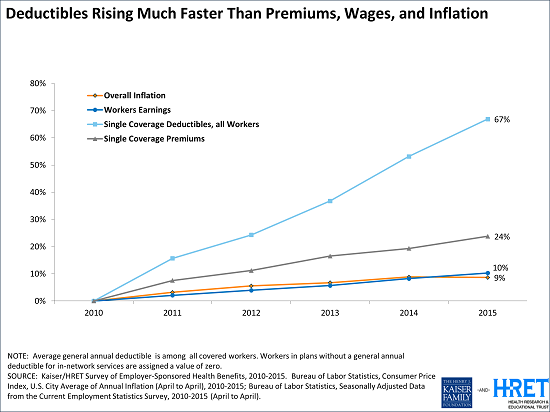 In September 2015 KFF published one that does – the trendline for our deductibles: despite inexorably rising premiums, the insurance industry is also leaving us with more of the bill, by increasing our deductibles. 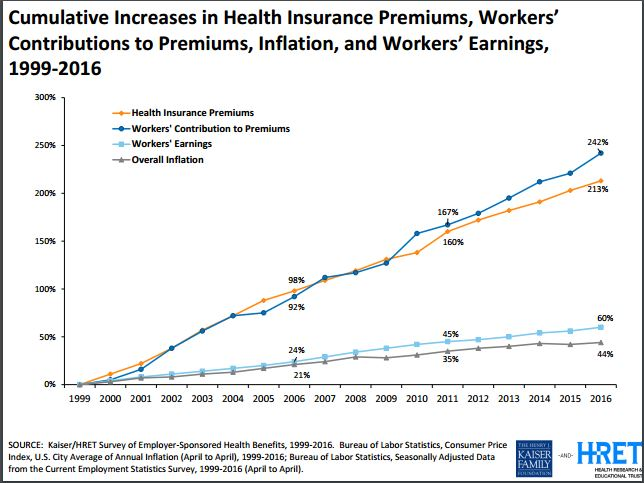 … “With deductibles rising so much faster than premiums and wages, it’s no surprise that consumers have not felt the slowdown in health spending,” Foundation President and CEO Drew Altman said. “Consumers [that’s you!] have not felt the slowdown” – no kidding! That’s because the money companies are seeing to it that they get their share first. Why this is called “insurance” is beyond me. Consumers cannot be expected to make these determinations, but consumers have a right to know the evidence behind the recommendation to have the test. Far too many tests are done with no indication, raising the concern of financial motivation behind test being ordered. Consumers have a right to understand why these tests are needed and where can they be done at the lowest cost and highest quality. 1. When I was shopping for a CT last year (because I was newly self-pay), I carefully matched what my hospital had ordered in the past. Because of questions asked by other providers, I discovered that my previous CT had included $400 of lab tests that were not actually needed – they’d just been added. For no reason. 2. 15 years ago, when I was also self-pay, I had what appeared to be a bladder infection. The local walk-in clinic sent out for lab work, which I paid for (cash). When I came back to get the results, the doc said the results were obviously wrong – “Ridiculous,” he said. So I said “I’ll get my money back, right? ?” And he looked at me like I was nuts. This is an industry that seems to be in serious need of basic consumer protection. Crazy: the guy said the test was obviously wrong, but it was absurd to want my money back?? This really is not secrecy; it is complexity. The problem for any customer service agent in a plan is that they can (usually) tell you what is covered, but they cant know the status of your deductible. They won’t know that until the claim (and any other potentially concurrent outstanding claims) are adjudicated. That can take weeks (easily). Ergo, even though a service is “covered”, it does not mean that the plan pays. It actually is “decided by the computer” in a practical sense. Is it that they cannot know the status of your deductible, or that they do not? And in either case, why? My point, Tim, is that if the people I get to talk to have no idea what’s going on, that’s ridiculous, and it’s not a functioning market. Once upon a time there were no computers that could dish up the comparative prices of computer products at 17 different vendors. Then that software got written. There’s no reason on earth why the same can’t be done in medicine, and I’m sure it will be, when it becomes a functioning marketplace. As end users, transparency and full disclosure prior to use is a must. We would not accept this system for the sale of a house, car maintenance etc. Those who did this years ago in full good faith for pension plans and money management were the ones whose future was compromised. If we have full transparency in research with all trials registered and reported how much more is this an ethical and practical absolute for our health care. As users we need to advocate, lobby and petition for accountability and transparency (full disclosure) and #WeAreNotWaiting!